Are your children upset because they can't reach the items while traveling? Do you constantly have to stop the car or reach behind to get the items your child wants? Does this inconvenience cause you delays, disruption and Stress? Various Mesh Pockets conveniently located within arm's reach. IMPROVED LONG TERM STABILITY - Traditional Car Seat Activity Trays starting sagging and breaking down due to poor quality and usage. However, our car seat snack tray boasts a reinforced sturdy base support, sturdy side walls, strong buckles and long straps to ensure your stuff remains in place and you don't have to adjust it periodically. "REGISTERED PATENT#: US D795, 789 S"
SPILL-PROOF FINISH FOR EASY CLEAN UP: Our kid's car seat tray has extra soft pearl wool cushioning and TPU coating to both protect your baby and make cleaning a breeze. Simply wipe messes away with a wet rag and you're ready to go. Easy one click removal allows you to detach the activity tray anytime, even while in transit. LIFETIME GUARANTEE - Our motto is "Give them Quality. That's the best kind of advertising". We want happy & satisfied, that's why we're giving you a full refund or replacement for life to ensure premium craftsmanship although we are always happy to resolve whichever problem occurs. TURN TRAVEL TIME INTO PLAYTIME ANYWHERE: Our Play tray and activity center is perfect for not only car seats but can also be used with high chairs, conventional kid's chairs, or even air travel. Create a safe and clean station for eating and play no matter where you go with this versatile travel table. STRETCHABLE MESH POCKETS FOR STORAGE: Stretchable mesh pockets make great storage for toys, baby books, pacifiers, bottles, sippy cups, crayons and snacks. 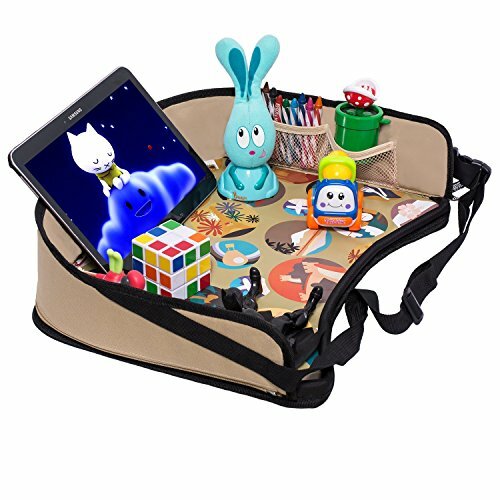 Go anywhere with one easy to install activity tray providing room for all your baby's or toddler's travel needs and Relax! Our kids lap tray is 100% safe, for you and for the environment. Non-toxic and PVC-free. If you have any questions about this product by DMoose, contact us by completing and submitting the form below. If you are looking for a specif part number, please include it with your message.